Sterling silver beads and findings. 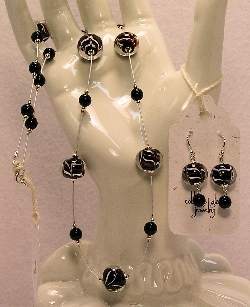 beautiful swirled lampwork beads, and a black glass bead drop. Perfect for everyday wear. Please note: these earrings will be made as close as possible to the pair shown above. Because lampwork beads are individually made by hand, each piece will be unique.